December in Spain, as in most of the West, is dominated by Christmas and New Year's Eve. As a result, there are less events going on around Spain. A lot of Spaniards go home to visit their families in the villages, leaving some of the cities a little quieter than usual. On this page you'll find details of what events there are going on in Spain in December to help you decide where to visit. Barcelona's events calendar in December isn't as full as most months as most people retreat from the cold and spend time with their families, but there's still more going on than elsewhere in Spain. World Press Photo Exhibit at the CCCB. 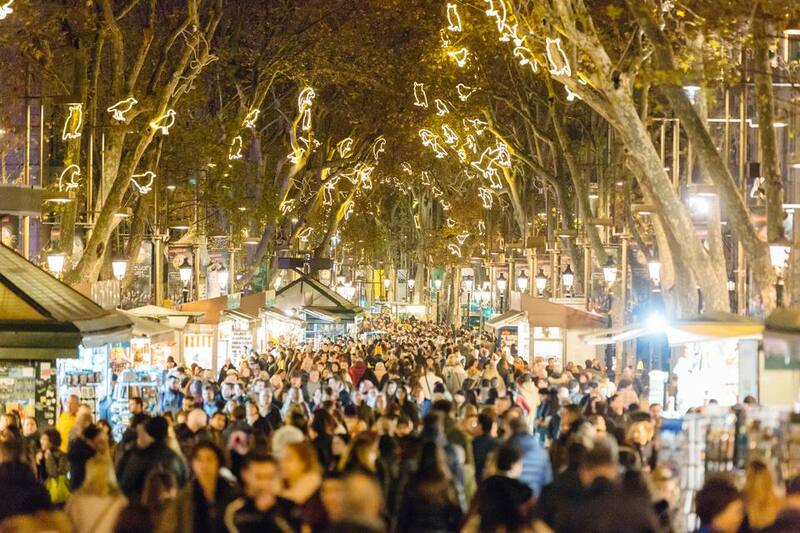 There are Christmas markets throughout Spain, but one of the biggest is in Barcelona. Two fun runs: the Buff Epic Run, a costumed fun run, and the Cursa dels nassos. Christmas will be fun in Seville, but the city has a unique event of its own this month. See the traditional Dance of the Seises at Seville's cathedral in the Inmaculada festival. Budget Room 30-seconds' walk from Seville Cathedral I have stayed here personally - this clean apartment cannot be beaten for price and location. As with Barcelona, there aren't that many events going on in Madrid this month, but Christmas is at its biggest and grandest in the capital. Particularly, you will find it easier to eat at a restaurant on Christmas Eve or Christmas Day here than in the rest of the country. San Silvestre Vallecana fun run on New Year's Eve. If you have access to a car, the Costa del Sol has a few events spread out over the region that are worth a look. The Costa del Sol is usually seen as a summer destination, but if you aren't desperate for beaches then there is still plenty to do in the region, even in winter. Torrax migas festival - a festival to celebrate a single dish - the peasants' favorite, fried breadcrumbs dish called 'migas'. Malaga Verdiales festival - a festival to celebrate a type of flamenco. These events are spread along the south coast of Spain. Staying in Malaga is your best bet if you want to hit up these festivals. Salamanca is a student town, so a lot of the city's inhabitants go away for Christmas and New Year. So they can celebrate with their friends, they host an early New Year's celebration in the town square for everyone to get involved in. Just one interesting event here: El Baile de los Locos y El Oso with musketeers, swordsmen and a dancing man dressed as a bear. To reach Fuente Carreteros from Cordoba, you'll need a car, but with little accommodation Fuente Carreteros itself, this is your best bet. Spain has the biggest lottery in the world (by total prize fund). The vast majority of the population has a stake in the lottery, either as part of a syndicate or ​with an individual ticket. Every year, on December 22, TVs and radios will be tuned in to hear the results (which takes several hours). Get a ticket and join in the fun anywhere in the country. Read more on El Gordo Lottery in Spain. Christmas in Spain is a family affair. Christmas Eve is the bigger event, with families gathering for an extended meal. Restaurants may be closed on one or both of Christmas Eve and Christmas Day, and will almost certainly require reservations if they are open. Madrid and Barcelona, as the biggest cities, have the most life to them around this time. Read more on Christmas in Spain. New Year's Eve is also largely a family event. The stroke of midnight is either spend in the main square of a city or at home. Most bars will be closed, opening around 1am for a night of revelry. Wherever you choose to celebrate, make sure you have twelve grapes to eat at each gong of midnight. Read more on New Year's Eve in Spain.